After watching the debate at the Reagan Library and spending couple of days mulling it over, a few thoughts came out. My initial thought was that Perry did not help himself, for while there were moments that he did shine, there were also moments that he looked unprepared. I will discuss more on this later but the number of pundits who viewed this still a two man race between Romney and Perry were numerous and the number who felt that this debate helped Perry outnumbered those who didn’t. As for me, the two issues that bothered me was his answer on climate change and social security. He had the better arguments, but he failed to press his advantage for he was unprepared to give the right defense of his stances. On social security, it is not enough to say it is a Ponzi scheme but explain why it is. In a few years, we will have two workers to support every beneficiary as opposed to a sixteen to one ratio when the program began. Do the math and figure out that it won’t be long before the whole program comes crashing down. As one pundit explained, it is worse than a Ponzi scheme for a Ponzi scheme depends upon willing investors, but social security is not voluntary and the government can increase taxes to pay for it. There is only so much one can spend and tax before an economy implodes. Think of Greece and you see the future, but Perry did not say that. Actually the best answer on this came from Herman Cain who talked about the Chilean experience when they reformed their social security system. Wasn’t it FDR who stated his long term goal was to term social security into an annuity? One more thing in reference to Karl Rove, didn’t his boss introduced social security reform on the idea that it needed changes or else the whole system would collapse? I like Rove, but his criticism of Perry's stance is making it hard for all Republicans to talk entitlement reform. On climate change, Perry had the right argument, but he failed to come up with one scientist who is skeptic. Maybe someone on his staff might want to hand him a list from Senator Inhofe, who can give him a list of 500 scientists who challenged the conventional wisdom. (His answer comparing the skeptics to Galileo was inspired and this drives the left nuts.) On the other hand, his answer to Williams on the divide between white and black was actually pretty good. He simply ignored the premise that racism is responsible for the divide and noted that a rising tide raises all. His answer on the death penalty may have been the game changer, for Perry not only defended the death penalty but noted that there is a procedure put together by elected officials and supported by the people, before adding that if you commit murder in Texas; the ultimate justice will be issued. Take that NBC. Romney showed himself to be a cautious conservative, who showed knowledge on the issues and was able to parry shots against him. 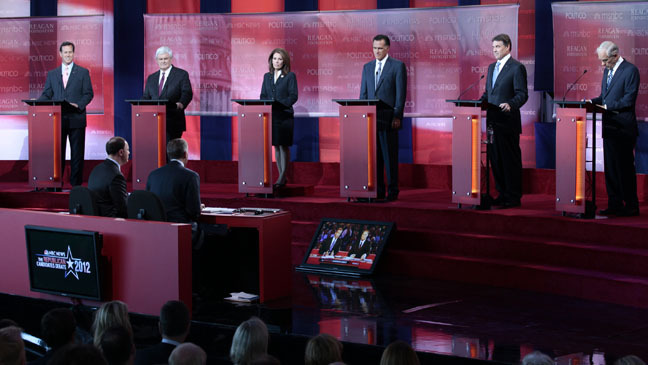 His own economic plan is hardly radical when compared to others like Huntsman's tax plan and Cain's 9-9-9 plan, but during the debate, he showed himself disciplined. He knew when to attack and defend and then, when not to attack. During the portion when Perry's decision on the HPV vaccination was being attacked on all side, he noted, “We all make decisions we regret and would like to have back.” He stated he was willing to give Perry mulligan. Nice touch, it shows a politician who is already looking to unite the Party. Herman Cain and Newt Gingrich provided their own fireworks. No, they are not going to win, but they showed why they are good at debating. Cain showed himself to be charming and sharp when defending his proposals, and bringing up the Chilean experiment on social security showed a maturing candidate. Gingrich is the smartest guy on the stage and often shows it. However, everyone knows that after Iowa, his day on the campaign trail is over, but the man still has it when it comes to debating. This was the night that Michele Bachmann needed to get back into the race, but in an eight person debate forum, not everyone gets a fair shot. She simply disappeared through most of the night as others go the nod. Bachmann did not do enough to supplant either Cain or Perry for the conservative and Tea Party support. Perry did enough to keep his place as one of the top two, and Bachmann did not break through. She is riding down the path out of the race, and now she has to work Iowa or else she is done by February. Many conservatives complained that no Republicans should participate in any debate sponsored by MSNBC, but actually, I felt the questions were legitimate questions that needed an answer. These were questions that were bias to the left, but there were questions that allowed some of the candidates to hit a home run. Perry's answer on the death penalty not only put Brian Williams in his place, but it possibly saved the debate for him and reminded others why he could be a great campaigner. Plus many Americans got a glimpse of what the network has turned into. Once the debate was over and left wing nuts on the networks started to blab, it only took five minutes before most of America reached for the remote. As Bernard Goldberg quipped on O’Reilly report, “The panel discussion was balanced between the far left, the really far left and the really, far, far left.” MSNBC didn’t even bother to invite their house conservative Morning Joe to the pow wow afterwards. It simply reminded Americans why Fox is number one. Overall, the Republicans are improving with each performance, and one could easily imagine any of those candidates being President. And these performances easily overshadowed President Obama's speech the next night, who simply gave us the same jobs speech he has given for the past two and half years with the same old ideas that haven’t worked.